Item Number: 266-710A 19603 Actual Weight: 2 lbs. Use in hospitals, physician offices, and schools when treatment requires protection, support and compression. Self-adherent elastic sticks to itself without sticking to other materials, skin, or hair. 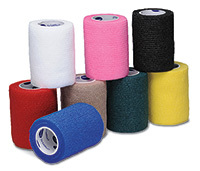 Latex-free elastic bandage is water resistant, lightweight, and air permeable. Assortment includes: black, white, yellow, red, blue, tan, green, and pink.